Encyclopedia of Aesthetics, edited by Michael Kelly. Oxford University Press, 1998. 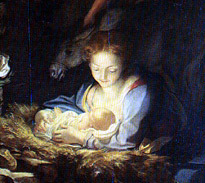 Grove Dictionary of Art Online. Kandinsky, Wassily. Concerning the Spiritual in Art and Painting in Particular. Translated by Michael Sadleir. New York, 1947. Kittler, Friedrich. Gramophone, Film, Typewriter. Translated by Geoffrey Winthrop-Young and Micheal Wutz. Stanford University Press, 1999. Mitchell, W.J.T. "What Sculpture Wants: Placing Antony Gormley." In Antony Gormley, edited by John Hutchinson, E.H. Gombrich, Lela B. Njatin and W.J.T. Mitchell. London, 2000. Plato. "Phaedrus." The Dialogues of Plato. Translated by Benjamin Jowett. New York, 1937. Smithson, Robert. "Fredrick Law Olmsted and the Dialectical Landscape." In The Writings of Robert Smithson, edited by Nancy Holt. New York University Press, 1979.
life. In some examples with implication of other senses. perception of a purely intellectual character. or independent of, anything physical or material. The word spirit, descended from the old Latin spiritus, which translates to breath, embodies a variety of meanings in modern culture; a ghost, a soul, a feeling, a movement, a drink. Even in the case of media studies, and more narrowly defined as a metaphysical essence, its meaning shifts with perspective. It can be narrowly defined as the "animating . . . principle" (OED) of a man in the philosophical sense, broadened to include the essence of an age or work or artist, and finally, it can recall the animation of all afterlife in a more expansive sense. Closely related to inspiration, which translates literally as the drawing in of breath, spirit is that which brings life- that which creates. For the study of media, this essence of creation is central. Both in the creation or communication of an idea or concept within the work and also, in the discussion of essence. The first focused on animation or the bringing to life through a medium and the second on analysis- discovery of what is at the heart of a medium: an artist's work, technological progression or the essence of a generation. The term spirit refers to that which is intangible and yet central to an understanding of a person or thing. The elusive nature of the term makes any definition or explanation feel incomplete, but generally speaking, it is the "immaterial" in the life of man- the soul or consciousness. And with that starting point, the definition plants itself deeply into the core dichotomies and relationships that provide media studies with a field of study. Spirit is one of those abstract terms that can often only be understood by what it is not; the unconscious not the conscious, the immaterial not the material, the soul not the body, the immortal not the mortal. It is the fingerprint that remains when the hand is long gone. In developing a working definition of spirit for use in media studies, the first focus must be on the various levels of analysis. The spirit of the body, the spirit of the artist or, more broadly, the spirit of the world beyond reality. Each of these perspectives is discussed in the literature of media and each has specific applications for study, but all relate to this discussion of animation and the energy it provides for both creation and life beyond death. The spirit, understood as the animation of man, is itself a powerful medium. It is that which allows one man a life and also, relations among men. It contains the being, or the essence, of a person and therefore, also functions as the energy of man, that which allows him to be recognized as distinct and alive. It is the medium separating the living from the dead. And in this role, it is filled with great power and even great danger. Discussing the origins of sculpture, W.J.T. 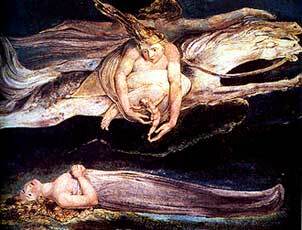 Mitchell begins with the first animation of man- God's creation of Adam and Eve. "The dangerous moment is . . . associated with animation, when the sculpture takes on a 'life of its own'- when it begins to speak, move, breath, acquire consciousness, act on its own . . ." (Mitchell, 166) Life begins with animation. When man speaks and moves, he is considered alive, and a spirit or animating force, is essential to that life. The artist Wassily Kandinsky also sees the spirit as a medium, but more specifically between the soul and the sensory world. He speaks of the body, or the material, as merely a point of access between the spiritual yearnings of the soul and the art that expresses, communicates, and builds up that very spirit. "A work of art consists of two elements, the inner and the outer . . . The inner element, i.e., emotion must exist; otherwise the work of art is a sham . . . The determination of the form of a work of art is therefore determined by the irresistible inner force: this is the only unchanging law in art." 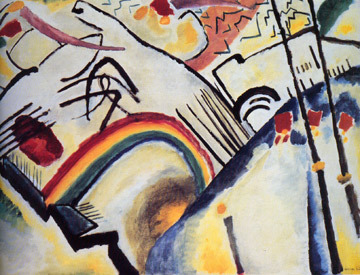 (Kandinsky, 23-24) So for art, as for man, their exists both a material and immaterial form. The first informed by the second, otherwise there is no authenticity. 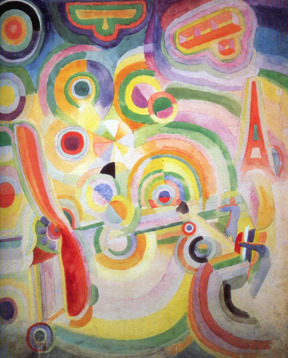 Kandinsky goes on to discuss the distinction between art that communicates this spiritual growth and art that merely satisfies a material drive; one which allows the artist's soul to speak to the soul of an observer and one which is appreciated for technique alone, prompts no emotional response from the audience and yet, may provide material success for the artist. He values art as a spiritual expression beyond the material production and in this focus a connection is revealed between spirit and the distinction between high art and low art, which is centrally relevant to the field of media studies. High art reaches for something better, something immaterial, something spiritual, while low art sees no such horizon. Low art is focused on the "nightmare of materialism, which turned life into an evil, senseless game." (Kandinsky, 24) Kandinsky's explicit value judgement between spiritual and material mirrors many such discussions where various art forms and various media are contrasted as more or less pure, more or less spiritual. In this case, spiritual becomes a quality with which media can be ranked and divided. Lastly, it is important to mention the importance of spirit within classical philosophy, which so strongly informs modern critical theory. Particular to spirit is the connection between material actuality and spiritual form; the goal of all enlightened men to strive for purity of form- to realize potential. 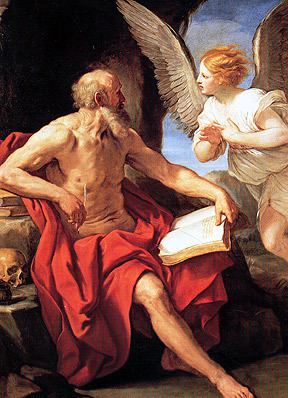 For philosophers like Plotinus, the soul's longing is for material beauty within which a person can see the potential of the soul realized. " Beauty exists when the material as which a thing is realized is wholly given over to the resistance-free expression of form: beauty is intelligence displaying itself." (EA, 6) In other words, man admires beauty because it reminds him of his own soul's yearning- material beauty seems most like the spirit unmediated by the restrictions of the world. Here, too, the discussion centers on spirit as essence, but specifically, it is the essence as experienced through another medium, a painting or a radio program or a work of literature. Here it is as if the person- the other- has left a mark or remnant of his or her own animating essence on a thing, a place or a work of art. And in that remnant, the living seem to know and communicate with the spirit of the author or producer. The work becomes the medium through which the living can know the dead, or at least the stranger can know the artist. Friedrich Kittler uses Salomo Friedlaender's story on Goethe to illustrate this belief and quotes, " ... the vibrations produced by Goethe are still in existence . . . ". (Kittler, 60) He writes literally of the acoustic vibrations produced by Goethe's voice in his lifetime, but it also hints at the power of the work left behind to make accessible the spirits of the past. On the other hand, some theorists would argue that it is not the artist's spirit instilled in the work, but that the spirit of a thing or place is brought to light through the work of the artist. Alan Gussow writes "what [landscape] artists do is make these places visible, communicate their spirit." (Smithson, 122) And while critics like Robert Smithson would mock this form of spirituality as naive, it is still an important aspect of how art and media use the concept of spirit- here as an essence of the real brought forth in the representation. The art of the Yoruba tribe, originally of Africa, also supports this definition of spirit. The Grove Dictionary of Art defines the Yoruba idea of beauty as the expression of a thing or person's spirit . . . "At the core of Yoruba aesthetics is the saying 'character (or essence) is beauty' ( iwa l'ewa ). This refers to the essential nature of a thing or person. When art captures the essential nature of something, the work will be deemed 'beautiful'." (GDA) In this sense, similar to the work of Plontinus mentioned above, beauty in art centers around the concept of spirit and the importance of revealing that which remains elusive, and yet defining, within a person. It is also important to think of modern media forms from this perspective. Brian Larkin's work among the Hausa in Nigeria reveals an alternative, but still "rational" interpretation of cinema. For these people, especially the devout Muslims among them, cinema remains a form of sorcery. Early names for the medium include "majigi, derived from the word magic and dodon bango, literally, 'evil spirits on the wall'." (Larkin, 328) Here the spirits of another place are revealed through the medium of film and therefore, prevent any devout Muslim from feeling safe within, or even neutral about, the cinema. Kittler also gives voice to these types of interpretation. He mentions the reaction of Balzac to photography as a stealer of spirit. (Kittler, 11) Similarly, he mentions the idea that the "white noise" of radio and recording plays host to numerous untraceable voices, which have been assumed to come from another world- a world of disembodied spirits. (Kittler, 13) There is an implied sense of danger inherent in a disembodied energy and in many ways this danger is carried over in to the world of modern media. For Kittler especially, the energy of modern media takes on a life of its own which can neither be seen or properly explained as purely technological. "Film is an immeasurable expansion of the realms of the dead." Media moves beyond the borders of the concrete into unexplored, unnamed territories. The world of ghosts and spirits can be found entrenched in almost every work of media studies, revealed as a trace, an echo, an imprint, a soul, a ghost or a machine's output that effects us in mysterious, powerful ways. All are produced by a spirit, of one man, an artist, an age, a memory or a dream. And all draw away from the concrete reality of the material into the life force, which can not be dissected, but seems to power creation in the world. Kittler quotes Rilke's essay on the phonograph . . . "the sound which had been ours came back to us tremblingly . . . we were confronting . . . a new . . . point in the texture of reality." (Kittler, 39) Here, the boundaries of reality seemed to shift with this new technology. Specifically, the boundaries of what is self and what is reflection of self and what is something new altogether- all seemed to disappear and then reappear anew. His choice of words also hints at the idea of a ghost. A soft echo of voice, which fades in and out, as one may expect a spirit from another world to appear as merely a shadow.